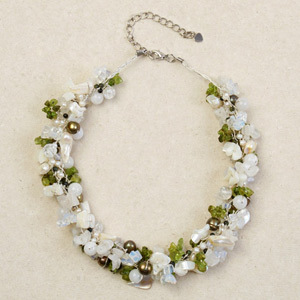 Knotted by hand on rayon by jeweler Sirada, gemstones cluster in a multi-colored garland. 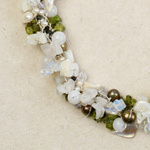 Pearls mingle with peridot, quartz, milky quartz and glass beads. The lobster claw clasp features an extender chain to adjust the necklace to the desired length. 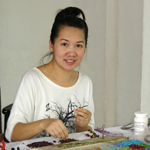 Materials: Peridot, quartz, pearl, milky quartz, glass, rayon and stainless steel.